3.6 out of 5 based on 7 bloggers and 2 commenters. 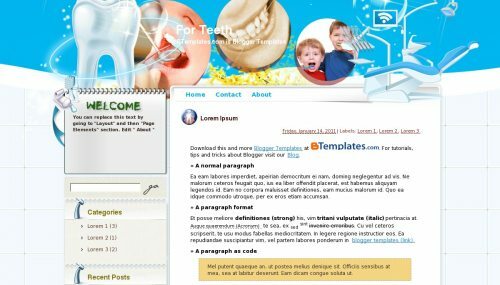 For Teeth is a free blogger template adapted from WordPress with 2 columns, right sidebar and rounded corners. Excellent template for blogs about health and beauty, people or science. Good to read your post. But for still i am not interested to make a new site. Thanks to share good information and its an easy way to creat a new website.